As teachers, we excel at teaching our students to share, but when it comes to other teachers on our grade level, well, that’s another thing. Some teachers are afraid their teammates will think they are bragging if they share a great idea. Others have heard snippy comments from the team’s Negative Nelly, so they no longer feeling comfortable sharing. Making yourself vulnerable is hard to do if you have a negative climate. Research shows that collaboration is beneficial for both teachers and students. So, why is true collaboration, working as a functional team so difficult? Have you watched television shows like Dr. Phil show lately? If so, then you’ve seen first hand examples of dysfunctional families. Teams of teachers, like families, can be functional or dysfunctional, too. Both families and teams are made up of people. Each person has his or her own unique personality, strengths, weaknesses, and experiences that affect how we interact with others. All of these can work for a team or work against a team. 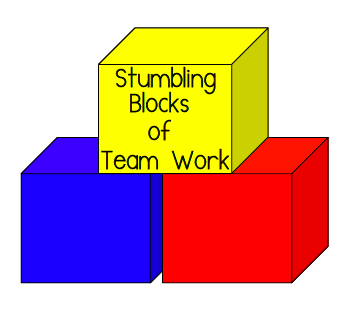 There are a few personalities that are stumbling blocks for team work. Not every team will have all of these personalities on their team. But, even one can cause teams to stumble. Negative Nelly will always have a few choice words to put a damper on your enthusiasm. Nelly is concerned about how much work is involved with using your idea. She is the type of teacher who should have been a lawyer because she is extremely legalistic. She is probably one of the few teachers on your campus who has read your teacher’s contract frontwards and backwards. If your contractual time is 7:35 – 3:20, she will show up at 7:35 and leave at 3:20 without a paper or book in her hand to take home. No grading papers at home for her because your district gives teachers prep periods for a reason. She follows the letter of the law when it comes to your contract. Her other concern is parental complaints. She is afraid her parents will complain if they hear about all the great stuff your students are doing. This is why she is so vocal at meetings. She not only wants to make decisions in her classroom, she wants to decide how you should teach, as well. Stuck-In-a-Rut Rita is less than pleased with your great idea, too. Rita has been teaching the same lessons the same way her entire career. She doesn’t have 14 years of teaching experience. She has one year of experience 14 times. She doesn’t care what you teach or how you teach. But you’d better not come to a team meeting and tell her how to teach. She’s a live-and-let-live kind of person. Frankly, she doesn’t care if her parents hear about the wonderful things in your classroom, because she’s content with the way she teaches and she’s not about to change now. If it’s not broken, why fix it, is her motto. Timid Tina is actually open to new ideas, but she’s afraid that if she shows support for your idea, she’ll feel the wrath of Negative Nelly. Timid Tina has some great ideas, too but her teammates never hear about them because they intimidate her. If you walked in her classroom, you would be surprised and impressed with what her students are learning. When she closes her classroom door, it’s just her and her students so she can teach her heart out. She has great ideas, but she doesn’t want her star to shine because then she’ll face her teammates’ wrath. She’s content flying under her teammates’ radar. Not every team is made up these personalities. Just like one student can affect the chemistry of your class, having one of the personalities above can affect the chemistry of your team. To have collaboration and true team work, the expectation needs to come from the top. It helps if your principal gives clear expectation of his/her view of team work and how it should look. Team work is not a code word for every class on the grade level teaching the exact same lesson everyday. No matter how much effort is put into making class lists, there will always be differences from class to class. One class may be full of strong writers but be weak in math. Another class may be math wizards but need extra support with reading. Each teacher needs the flexibility to adjust lessons to fit his/her class. Working as a team can give you resources to better meets the needs of your class. Each teacher has strengths when it comes to teaching. Get suggestions with your puzzle kids. Puzzle kids are those students you can’t quite put your finger on. You know they aren’t learning all they should be, but you can’t quite identify what the problem is. Your teammates can help you brainstorm ways to help your student. This is true R.T.I. at its best! You’ve heard of show ‘n tell for students, with teachers you can have show ‘n share. For show ‘n share, each teacher brings one idea to team meetings to share. Each person shares what he/she liked about the idea and gives each teammate a copy of the idea. This also helps with the Hopalong Cassandras of your team. Hopalong Cassandra takes the path of least resistance. She is content to hopalong on her teammates’ coat tails. She would rather have ideas and lessons handed to her, than expend her own effort. You will often hear her say, “Many hands make light work.” Well, the problem with this scenario is Hopalong Cassandra’s hand wants a hand-out instead of using them to lend a helping hand. When each person is required to bring a favorite idea of what he/she is teaching to team meetings, each person is held accountable. You will find this will also help with teacher burnout. Most teams have at least one teacher who is an Above-and-Beyond Annie. Yes, Annie thrives on making every moment a teachable moment. She wants to reach every child. You can often find Annie on the internet looking for ideas for her puzzle kids or in the library checking out extra resources to enrich her lessons. She is a librarian’s best friend because she keeps the circulation numbers up, but also her worst nightmare because checking in and putting away all of her materials is a lot of work. But, even Annie needs her batteries recharged. How does she get recharged? She gets a charge out of hearing great ideas. Remember, not every team will have all of these personalities. Just like one student can affect the chemistry of your class, having one of the personalities above can affect the chemistry of your team. Is your team a candidate for the Jerry Springer show or Leave It to Beaver show? SO TRUE! I especially like your comment about how someone can have 14 years of first year experience. I always feel so bad for the students who end up with teachers who don't modify and change to meet the needs of the group in front of them. Great post! Definitely getting pinned! Love the teacher personality scenarios. HI. Great info but I get an error when I click on the printable. Help? Thank you for letting me know the link wasn't working on the download. I fixed it. Oh my goodness! This is sooo my grade group!! I experienced a lot of this being my first year teaching. I felt a lot of my enthusiasm being squashed by some not so eager veteran teachers! Some were very helpful and I was glad to be able to help them too! Thanks for sharing! I am your newest follower! I love the scenarios. I just returned from a PLC conference and this is soooo great for using as I meet with my team. However, the link to the printable gives and error. Thanks for letting me know about the broken link. I think I have it fixed. As I was reading this, I was mentally applying people I know in real life to each of these labels… lol.